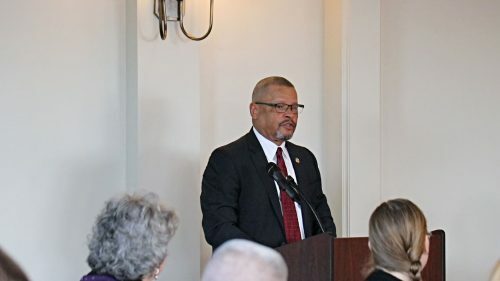 Education and the economy were focal points at the Prince William Chamber of Commerce’s Legislative Wrap-Up Breakfast. in Woodbridge on Thursday morning. Senators George Barker, Richard Black and Scott Surovell, and Delegate Luke Torian served as the panelists. They discussed a few accomplishments. Amazon’s decision to make Northern Virginia the home of its HQ2 and the $3 billion expansion of Micron Technology in Manassas are among them. “Those two projects are extraordinarily beneficial to the economy of Virginia,” Barker said. Surovell highlighted a project that aims to reduce traffic in Occoquan and also described the impact of the Amazon deal. Amazon employees could live throughout Northern Virginia. “I think it’s important to remember that’s a regional investment that’s going to pay dividends to all of us, and not just Arlington and Alexandria,” Surovell said. The legislators also discussed plans to support education. Providing additional funding to school systems and investing in devices to help prepare students for the workforce. “We’re making progress, but I still think we have a long way to go,” Surovell said. Black’s retirement was brought up, as well.